Horacal (Planetary Times) will assist you in finding the Raahu (also known as Rahu, Raahu kalaya, Rahukaalam, Rahukalam, inauspicious time) Gulika and Yamagandam periods. Most of the other apps in market use a common mechanism of calculating Planetary Times. They simply calculate it by considering 6.00 am as the sunrise time irrespective of places. It is quite obvious that the time of sunrise differs from place to place. 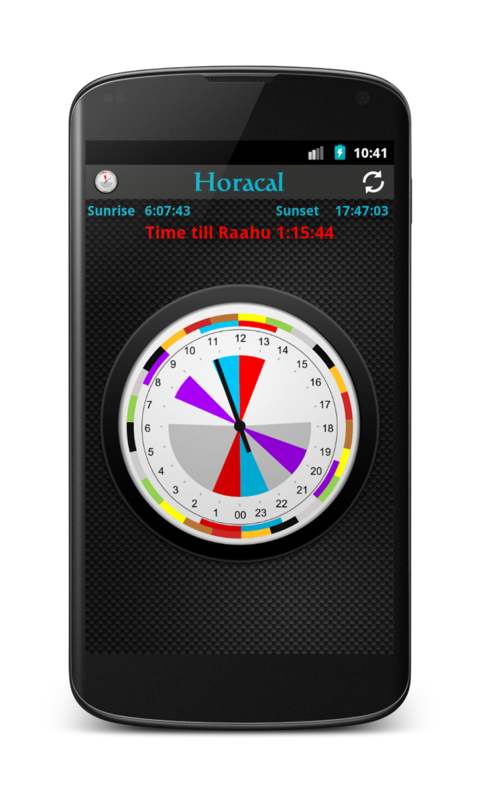 Horacal android app is very specific regarding place of the native and the time of sunrise as well. It calculates the place as it is endowed with GPS system and therefore, Planetary Times calculated by Horacal is very precise. Horacal android app has minimized the chances of inaccuracy of the Planetary Times to nil point. Period of Raahu is a certain amount of time every day that is considered inauspicious. It is a good idea to avoid Raahu period before starting any new activity. Any activity commenced during Gulika period will be repeated once again. So its an auspicious time for starting activities like building a house, buying assets or vehicles. Yamagandam means death time. Only death ceremonies are performed during this period. Activities during Yamagandam leads to a failure or destruction of the end-result. Avoid commencing important, money-related or travel activities during this time. The app also enables the user to turn on/off other horas (Ravi - Sun, Chandra - Moon, Kuja - Mars, Guru - Jupiter, Shani - Saturn, Shukra - Venus, Budha - Mercury) during the day as required. Precise time of these horas can be access by sliding your finger down on the screen. The app uses precise GPS location to determine the sunrise and the sunset in calculating the Raahu and Hora. The Raahu period is clearly shown in a 24 hour clock face in red colour. Other hora times can be enabled as required.